President Trump has been heavily criticized for his decision to retweet three graphic anti-Muslim videos. But why did Twitter allow them in the first place? The anti-Muslim videos were first posted by Jayda Fransen, deputy leader of the far-right party Britain First. They depict violent assaults and the destruction of a statue of the Virgin Mary. "To help ensure people have an opportunity to see every side of an issue, there may be the rare occasion when we allow controversial content or behavior which may otherwise violate our rules to remain on our service because we believe there is a legitimate public interest in its availability." "Each situation is evaluated on a case by case basis and ultimately decided upon by a cross-functional team," the spokesperson added. The spokesperson declined to answer additional questions from CNNMoney. 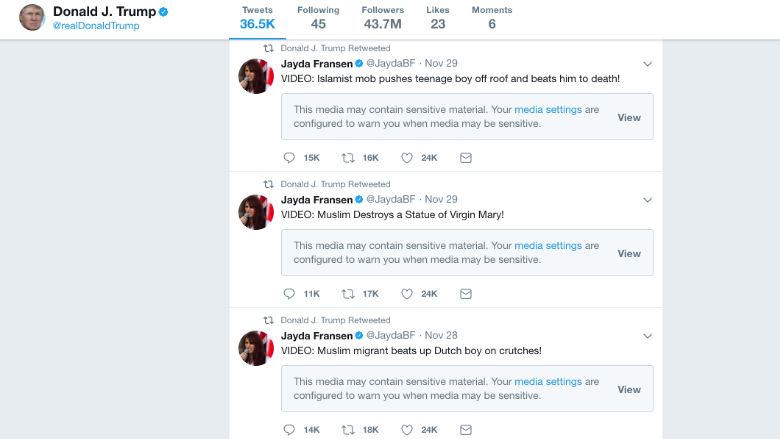 Twitter appears to have acknowledged, however, that the tweets constitute "sensitive media," which means they depict "some forms of graphic violence or adult content." Users with their accounts set to avoid sensitive media are warned that the videos "may contain sensitive material" and need to click through before being able to view them. None of the videos were filmed in the U.K., and two date back to 2015 and 2013. The third purports to show a young "Muslim migrant" attacking a boy on crutches. The Dutch Prosecution Service said the incident occurred in May and the suspect was born and raised in the Netherlands. It declined to comment on his religion because he is underage. Twitter, which has long celebrated free speech, has been criticized for not taking effective action against hate speech and harassment on its platform. CEO Jack Dorsey promised last month that he would implement more aggressive rules to curb harassment. The changes included plans to treat hateful imagery and hate symbols as "sensitive media." Twitter (TWTR) also said it would take action against organizations that use violence to advance their causes. Fransen was found guilty of religiously aggravated harassment in November 2016 after abusing a Muslim woman wearing a hijab. Trump has drawn widespread criticism in Britain for retweeting the deputy leader of Britain First. 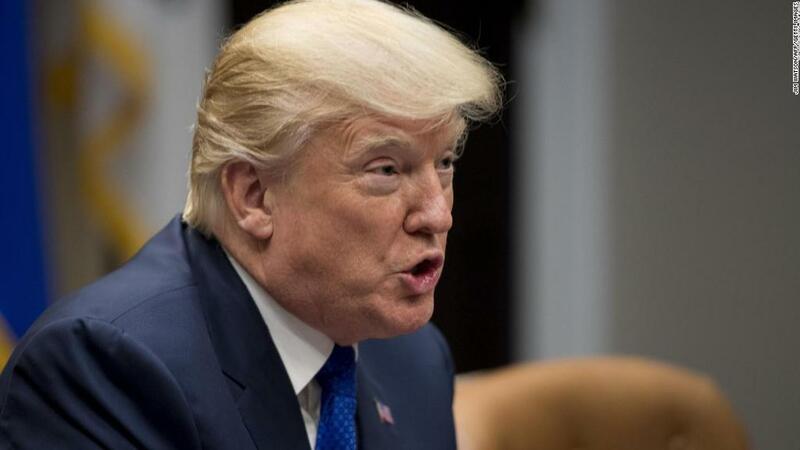 British Prime Minister Theresa May condemned Trump, saying he was "wrong" to share videos by a group that "seeks to divide communities through their use of hateful narratives which peddle lies and stoke tensions." Opposition leader Jeremy Corbyn called the messages "abhorrent, dangerous and a threat to our society." Trump also faced a barrage of criticism in parliament that was unprecedented for a U.S. president. Lawmakers variously called him "racist," "fascist" and "evil." One said that Trump should be charged with inciting racial hatred if he enters the U.K.